Who Knew Makeup Could Be So Shady? Who knew makeup could be so shady? All of social media is buzzing with swatches of makeup brands with very minimal color selections that leave you thinking "Wyd, sis?". If you're not into makeup, live under a rock, or just don't have any social media at all (I low-key applaud you), let me give you an example of what I'm talking about. A girl walks into Sephora to look for a new foundation. She's got an event coming up and she's trying to get that glow from within look ya know? She goes to a well-known brand and tries to find her color. Surrounded by shades of porcelain, light beige, medium beige, fair, light sand, light honey and everything in between, she struggles to find her golden brown color. As she slides her finger down the row of shades, she finds the darker shades; three of them to be exact: deep honey, cocoa, and mahogany. I'd like to say this ends with a good punch line like the typical 'guy walks into a bar' joke but nah..not this time. Women wear makeup to accentuate everything they already got going on. 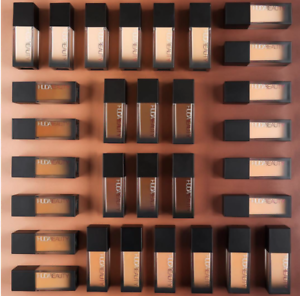 Some of us are minimal and some of us spend hours to perfect that flawless beat. If women from all skin types and colors are expressing themselves through make up, why does there seem to be an obvious limitation of diversity in shades? So, instead of revealing the brands that chose not to have a wide variety of shades, I'm going to highlight the brands who chose to make women of every skin tone feel beautiful. From higher end to drug store, you'll find a brand you love.